Today AMD published pricing for 5 new Istanbul SKUs – two designated as 105W APC high-performance SE and three as 55W APC low-power HE models. In the SE category, the 2439SE and 8439SE at 2.8GHz replace the top-bin 2435/8435 Istanbul which occupies the 2.6GHz, 75W APC bin. Besides the clock frequency changes, maximum CPU temp is reduced from 76C to 71C. As with all other Istanbul’s so far, these are HT3 bus parts running at 4.8GT/s. 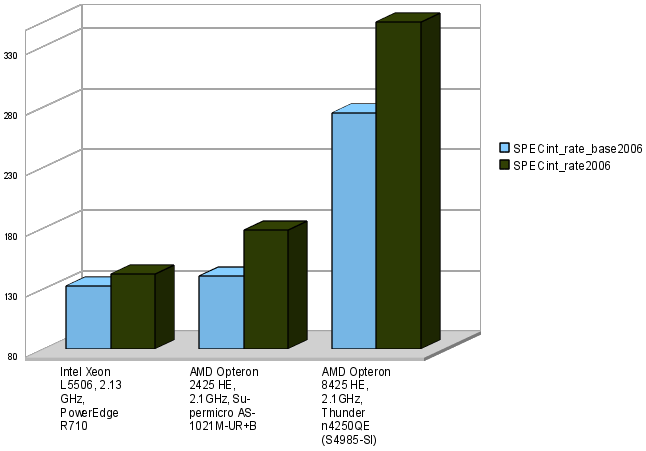 Price per socket has been announced at $1,019 and $2,649 for the 2439SE and 8439SE, respectively. 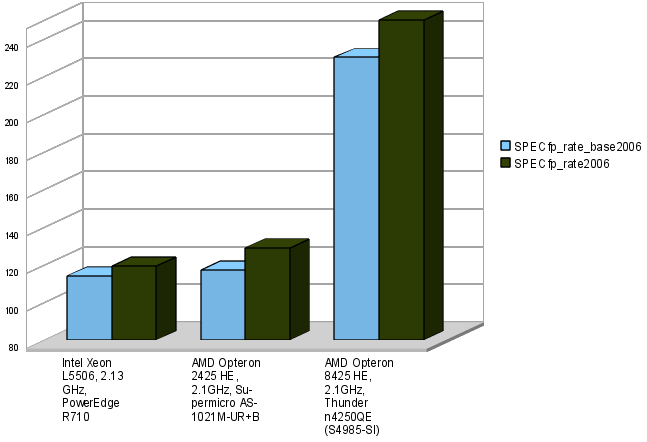 While the new SE parts do little to help the Opteron surpass the X5560 in raw performance, they fit well into the price-performance picture for AMD so long as street prices for the X5560 continue to hover in the $1,200-1,300 range. In the HE category, the 2425HE/8425HE and 2423HE are new clock speed bins running at 2.1GHz and 2.0GHz, respectively. These parts maintain the same 76C maximum CPU temp as the normal 75W ACP parts, but are selected to consume just 55W ACP. Again, these SKU’s also carry the 4.8GT/s HT3 bus of their Istanbul brethren. Pricing per socket has been announced at $523 and $1,514 for the 2425HE and 8425HE, respectively, with the 2423 HE targeted at $455 each. Here, AMD’s lower power target and pricing help the chip maker do some profit-taking as the price-performance of the HE parts appear to offer a measurable advantage over the L5506 (60W TDP) which is circling the $475 region (street price). See AMD’s official press release about High Energy Efficiency and the Processing Power of Six-Cores for more details. SOLORI’s Take: AMD has expanded the Istanbul line with both high-performance and low-power SKU’s as promised. With DDR3 prices inching downward, AMD’s price-performance position is eroding slowly as Q3/2009 approaches. However, the 2-to-1 price penalty for top-bin Xeon/Nehalem platforms will take a lot more time to overcome, leaving the AMD the solid choice for budget conscious virtualization. What’s perhaps more exciting for AMD followers – especially in the good-enough performance market – is sitting in the HE bin. The HE shows weakness in the 2P space, however, against the 2.26GHz L5520 part from Intel which sports 8 thread per CPU and can burst core speeds in excess of 3GHz with its “turbo” feature. This places the 2P 2425 HE somewhere in-between L5506 and L5520 in performance-per-watt, with 2425 HE maintaining a reasonable price-performance advantage. In the unchallenged 4P space, the 8425 HE, at 2.1GHz and $1,580 (est. street price) offers nearly 3:2 power savings over the standard part offering 24-cores at a little over 200W ACP (4P configurations). This savings will help scale-out clouds both private and public. Updated 7/15/2009: Added link to AMD’s press release.